The Legislature Killed Safe Routes to School Funding, So What’s Next? Pay raises for Colorado legislators, electronic traffic enforcement and student testing dominated state politics in the last session, overshadowing the casualty of a longstanding and successful program: Safe Routes to School. Some state funding remains for the 2015-2016 school year, but none for Denver. And after next year, no Colorado schools will have Safe Routes programs unless new funding is identified. 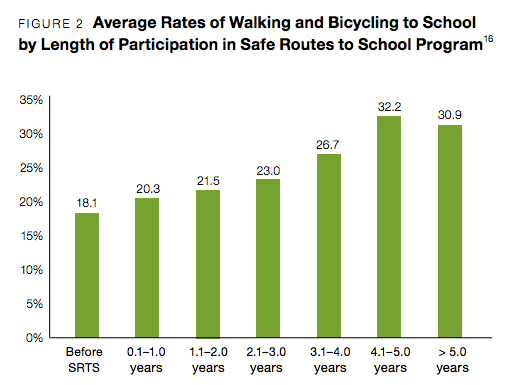 Safe Routes to School is a grant program that promotes biking and walking to school. 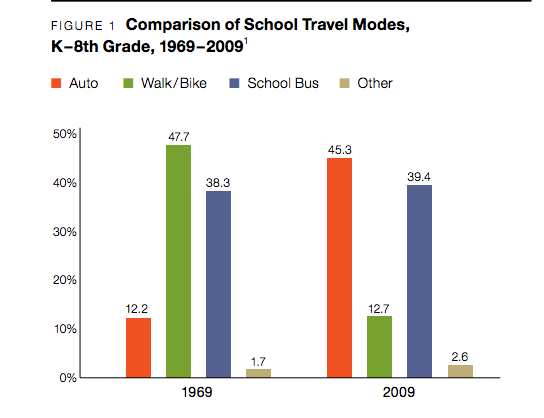 Nationally, the share of kids in kindergarten through eighth grade who walk or bike to school fell from 47 percent in 1969 to just 13 percent in 2009, according to Active Living Research. In Colorado, where childhood obesity is rising even faster than the rest of the country and one in four kids is overweight, reversing this trend could yield major improvements in public health. At College View Elementary in southwest Denver, the Safe Routes to School program included workshops on how to ride bikes and bike maintenance. Planners also surveyed the neighborhood and outlined the safest routes to take to and from the school, which is a high-risk area for walkers, according to the city’s Safe Routes coordinator Ashley Fredrick. About 200 students began walking or biking to school after the program started up in 2005, compared with “barely any” before, said Fredrick. In the last two years, Denver has doubled school participation in the program without spending any additional grant money. The program works. So what happened? Republican Senators Owen Hill (El Paso), Ray Scott (Mesa) and Jerry Sonnenberg (Eastern CO) killed the grant program in the Senate State Affairs Committee earlier this month, on the night before National Bike to School Day. In an email to Streetsblog Denver, Hill, whose district has received funding for more than 50 Safe Routes projects, said he wants the program for the children in his district but that “we need to be more creative” in finding funding. Actually, the Safe Routes program lets local governments design their own approaches. The Colorado Department of Transportation administers the grants based on applications from localities that tailor their programs to local needs. The pot of money for Safe Routes is small, but it goes a long way. In its last iteration, statewide budget for Safe Routes will be $700,000, split among 60 schools with 30,000 students. That money is a drop in the bucket compared to, say, the Colorado DOT’s $7.3 million budget for safety education. And it can help save money by reducing the substantial costs of bussing kids to school. Safe Routes is down but not out. Bicycle Colorado is searching for other ways to fund it, whether it’s through local school districts, private support, or even Congress.